It’s a lean summer in the garden. In an attempt to make less gardening work for ourselves, we opted to leave two beds unplanted. But besides that, the tomatoes haven’t done much, and the eggplant is taking its sweet time. When I told Kelly I was going to write about our garden harvest this month, she laughed outright. But there have been a few gems. I made my second batch of pickles tonight with a combined total of 6.25 lbs. of Bushy Pickling and Lemon cucumbers. 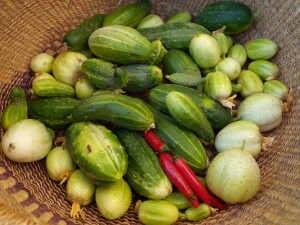 The Lemon cucumbers were impersonators—they were in amongst the Bushy Pickling and had the wrong tag. I’m keeping my fingers crossed that they turn out alright as pickles. Today’s cucumber and pepper harvest. These sweet and spicy little peppers found a home in a few experimental jars of dill pickles. Kelly grows them to add to her Indian cooking and will dry any remaining at the end of the summer. We let one of our kale plants stick around this spring. It is still big and beautiful. The chickens, who were raised on kale (I suspect it’s a comfort food for them) positively adore a ration of Dinosaur kale with their daily treats. When I added it to a stir-fry, Kelly gave it more mixed reviews. They grow like weeds around the chicken coop. Kelly dug some out to clear the path recently and cooked them up as part of a quinoa salad. Delicious! I maintain that Jerusalem artichokes are one of the most under appreciated and utilized garden yums around. 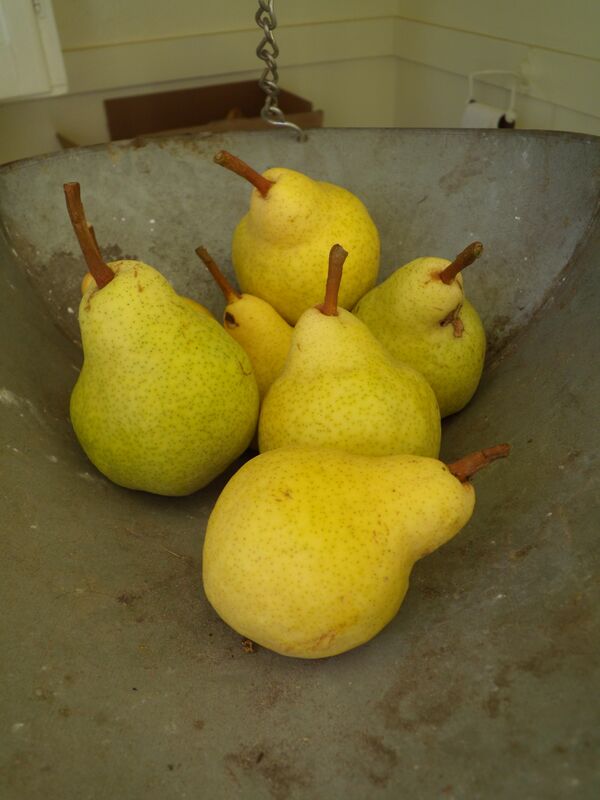 Although the Comice produced a grand total of zero pears in its second year, the little Bartlett gave us seven beauties. We even managed to save them from the neighborhood squirrels, rats, and raccoons by picking them early and letting them ripen inside. 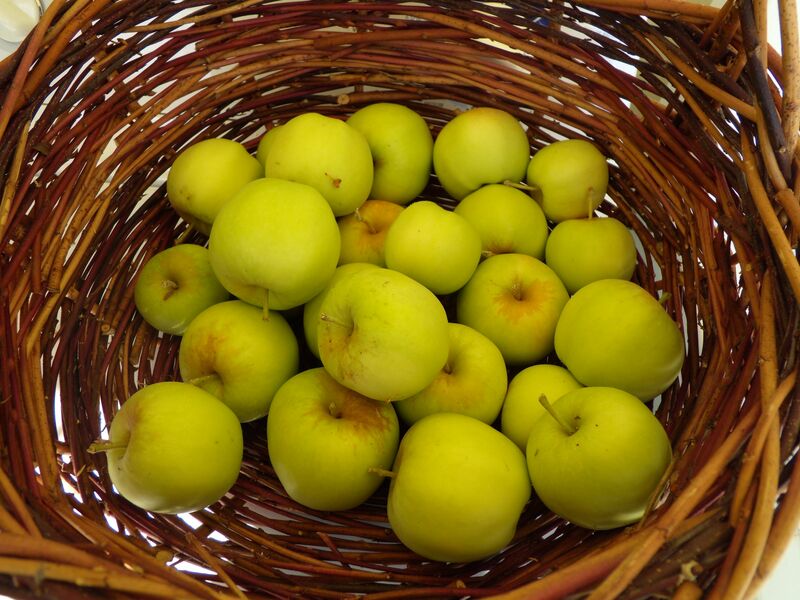 It’s not a great year for this apple tree, but I harvested 6.5 lbs. of apples a few days ago. The other producing apple tree (a mystery variety, perhaps Granny Smith?) 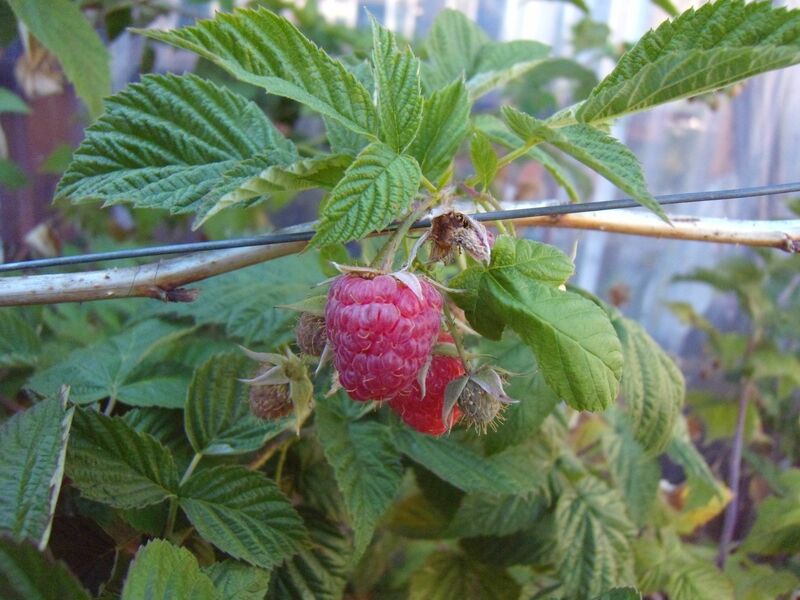 is not ripe yet, but it has more fruit. The centenarian fig tree’s fruit is starting to ripen. We picked the first figs tonight, and Kelly added them to a scrumptious baked apple, pear, fig, walnut, currant, and brandy concoction for which, tragically, there is no precise recipe. The raspberries are just beginning to produce again. Think palmfuls, not basketsful of berries. 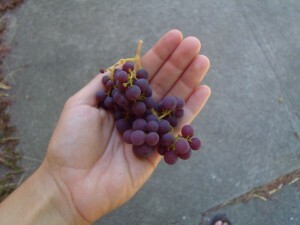 Our first and only bunch of grapes this year was delicious. I suspect that its proximity to a beehive spared it consumption by birds and squirrels. The girls are keeping up egg production. Luma has missed two days of laying since the beginning of Jluy, and Petunia has missed three or four since the end of July. I pulled two deep frames of honey from our superstar hive, Dave, at the beginning of August. We are due to make the rounds of the other hives and do more harvesting. 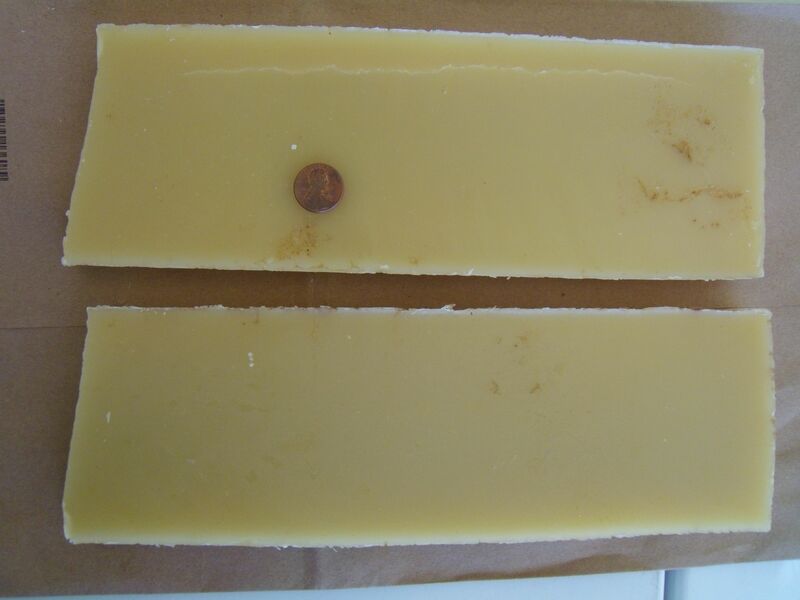 We melted down beeswax for the first time using our bee guild’s solar wax melter. 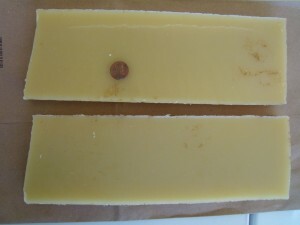 We are now the proud owners of two slabs of wax that we will make into candles whenever we have time (ha!). …With a penny for scale. With any luck we will start seeds for the winter garden in the greenhouse within the next few days. We are liking this minimized production, lower stress gardening (though Kelly misses larger quantities of produce), and are considering playing around with cover crops/bee food for the unused garden beds this winter. Luma’s laid a few doozies before, but yesterday’s egg was particularly funny looking. There is a distinct bulge on one side, and it has an overall cockeyed appearance, as if it were a fossil egg inexpertly chipped out from sedimentary rock. The picture doesn’t do it justice, but click to enlarge for a better view of the bulge. Luma seems healthy and happy enough, but I started fretting. A few quick Internet searches and a flip through my copy of Storey’s Guide to Raising Chickens, by Gail Damerow, yielded many possible explanations, but no concrete answers. 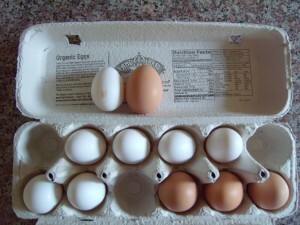 One interesting cause of lopsided eggs is especially frequent ovulation on the part of the hen. Sounds like, if a hen is ovulating too often, the unformed eggs may bump up against the egg that is on its way out. 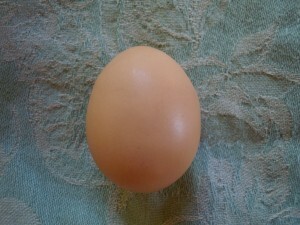 In this case, the less developed egg can get slightly “smooshed” by the one with the hard shell. Could it be that Lu’s marathon egg laying is leading to a traffic jam of sorts? Folks in online forums have discussed pullets laying oddly shaped eggs when they are getting into their laying groove. Should a month and a half be long enough for our Barred Rock pullet to find her groove? I don’t know. As a side note, I have never been quite sure what the term pullet means. 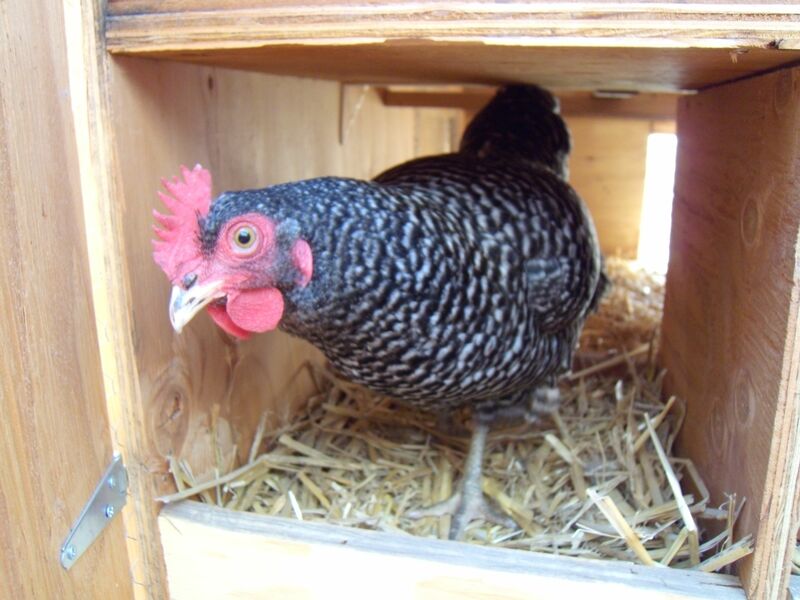 A pullet is a hen that is less than a year old. We’ve got a while before the girls graduate to full henhood. But I digress. Two other possible causes of eggs that are less than perfectly shaped are infection or other stressors. Kelly tends to be of the opinion that our pullets are perfect in every way, and it’s a bit of a hard sell to convince her that a mere egg bulge is cause for questioning. She agreed, however, that perhaps it’s worth doubling back and checking that our laying mash has the proper ratio of calcium and other nutrients (though one would think it would be formulated to have just that). In the meantime, the Barred Rock and Leghorn flock is devouring all treats, laying on an (almost) daily basis, and making a rather horrifying ruckus every morning at seven o’clock. Roosters, we have come to realize, are not the only ones that disturb the peace. Sometimes it seems that beekeeping is one drama after another. 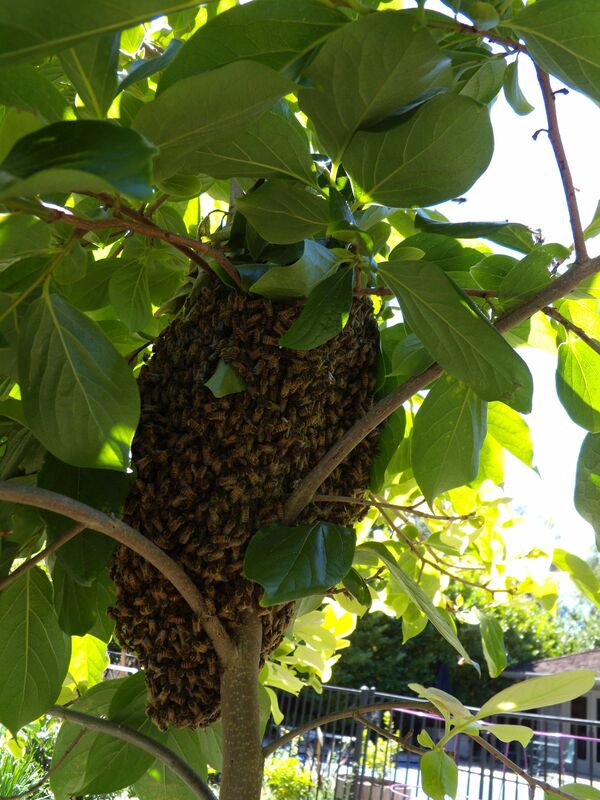 In the spring, it felt like we ran after a new swarm every two days. We spent late nights pounding out brood boxes and frames to keep our winged livestock happy and honey-producing. In the late summer, we have a different kind of drama. 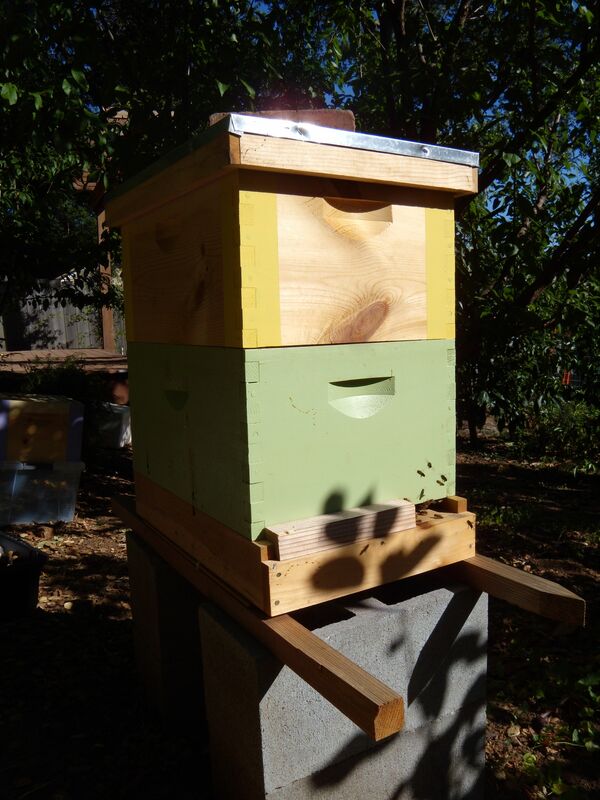 During routine hive inspections, we discovered that two of our hives are queenless. One, as far as we can tell, has taken no steps to raise a new queen. The other, with barely any bees left in the hive is clinging to a pocked, peanut-shaped queen cell. For reference, this is what queen cells look like when they are produced via “grafting” by bee breeders. The cells look the same in a hive, but they are dispersed across wax comb. Of course, Kelly and I went into instant panic mode. We usually do this while brushing our teeth, or attempting to run out the door to work. The question is what to do, and the answer, as always, is complicated by a muddle of reason, emotion, and doubt. If we believe in survival of the fittest and want to breed strong, local, survivor bees, we do nothing and let the hives almost certainly die out. Or do we? We suspect it’s too late in the season for a virgin queen to find drones to mate with even if the small hive can successfully care for its queen cell. This means that, no matter what, the genetics in the two queenless hives won’t carry on directly (though who knows how many drones from these hives may have mated with other queens over the course of the season). We’re left with two options for keeping the bees alive. First, we can combine the colonies with one that has a healthy laying queen. The advantage here is that the bees can pool their food resources and workforce, in theory increasing their odds of survival as a colony. The downsides are that they may also swap diseases and pests and that we will have fewer hives than we do now. The second option is combining the queenless hives and purchasing a mated queen for them (or frantically hunting for a late swarm, combining it with the queenless hives and crossing our fingers that the swarm queen is not a virgin). Either way, the idea is to introduce a new queen and let the bees take care of the rest. But can they? I put in a call to a guild member who placed an order for queens from a breeding facility this week. At this time of year, a mated queen bee will run you about $25. He urged us not to go the re-queening route because he doubted that the queenless bees had enough young nurse bees remaining to care for the brood that a mated queen would lay. In the midst of our decision-making (or lack thereof), nearly all of the bees from the more populous queenless hive took off, bringing me back to the question: do we really keep bees? Next time we discover a queenless hive, we’ll know to act more quickly to combine or re-queen, as we’ve now heard from others that bees frequently take off and attempt to join another colony if their own is without a queen or a queen cell. We’ve gone into damage control, drastically reducing the hive entrances to allow remaining bees a better chance of defending against robber bees. Tomorrow, Kelly will combine the two queenless colonies, and if no swarms show up (ha!) we will probably add the doubled up hives to Dave, one of this year’s strongest colonies. This whole experience reminds us of last fall, when we lost three out of four of our hives between late September and mid-November. The first died of pesticide poisoning, the second was something of a mystery, and the third suffered from the famed Colony Collapse Disorder (CCD). This year, we seem to be getting off to an early start. One of our beehive hosts recently sent us a link to a portion of Eddy Izzard’s classic beekeeping skit. It’s a highly comical, if not entirely accurate take on beekeeping. At the end of the day, I have to agree with Izzard: sometimes beekeepers do lose it. Sometimes we are covered in bees, and the veil and gloves aren’t enough to protect us. As Izzard suggests, Keeping bees is a strange term. How do you keep a group of winged creatures that numbers in the tens of thousands, communicates, organizes, makes some decisions democratically, and routinely moves on to new homes without your help? It might be more appropriate to say that we manipulate bees (or attempt to do so). I’m a naïve second year beekeeper with minimal experience harvesting honey, in part because 75% of our hives last year bit the dust. We didn’t use our smoker much last year; the bees seemed mellow enough, and the smoke was difficult to direct (most of it always seemed to gush out the leaky backend). This year, we are using it more. But when I found myself sans lighter at a recent hive inspection, I decided to go ahead without the smoke. I should have known better. The bees are cranky lately, eager to rob other hives and defensive against the possibility of losing their own hard-earned stores. It was late afternoon when I opened the hive in question. The sun was on the entrance, and the bees were very active–more active, in fact, than I’d ever seen them. I removed the lid and inner cover and immediately detected the telltale scent of banana oil—bee attack pheromone. The defensive hive in early summer when it was just a wee colony (I didn’t dare take any photos at my recent botched inspection attempt). I’m young and stupid; I kept going. 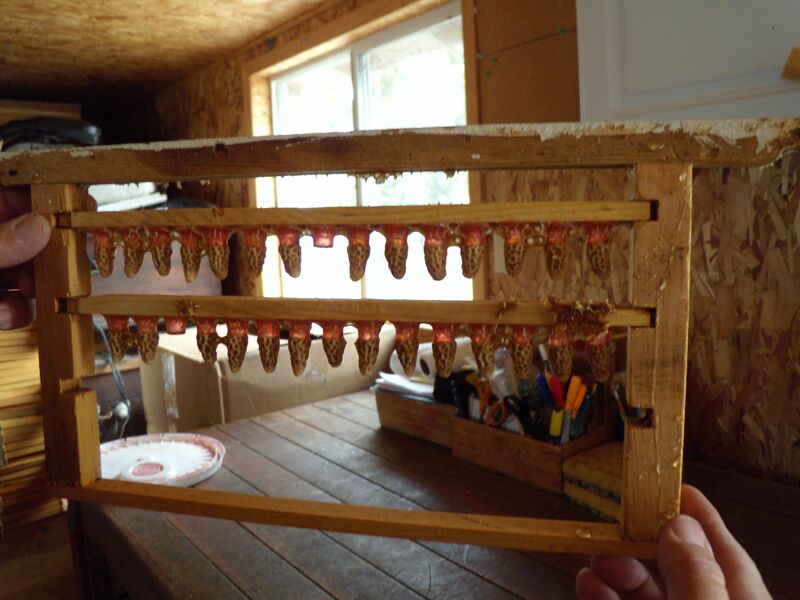 It was when I lifted out the first side frame in the upper brood box that I realized how mad they were. They rose up out of the hive in an angry, buzzing, cloud. My first irrational thought was that they were about to swarm on the spot. I have only ever seen that many bees issue from a hive when it is swarming. But these bees were not honey-heavy, nor were they house hunting. The activity was so intense that I knew I had to halt my inspection. Unfortunately, the bees were spilling over the edge of the brood box, and there seemed no way to replace the inner cover without squishing multitudes. I speed-walked away across the backyard (the one Olympic sport I’m fairly good at). I returned to the hive after several minutes, but the commotion had by no means settled. Instead, a group of bees instantly picked up my scent and was after me. I was stung once on each shoulder through my heavy suit and shirt. So much for a sense of security and protection. It was a full twenty minutes before I finally managed to approach the hive from a different direction and replace the inner cover and lid with minimal carnage. Even then, a group of bees followed me to the foot of the yard, repeatedly body slamming my veil in their quest to sting my face. I stood still with my heart pounding and made a feeble attempt at Metta, a Buddhist meditation practice centered on loving-kindness. When the bees finally moved on, I jumped in my car, still suited up with both shoulder bee stings flaming, and went shopping for a consolation jug of grapefruit juice. I’m struck by how quickly a mild-mannered hive can become aggressive when winter food stores are threatened. These bees paid me no mind when I walked up to them. They weren’t out to get me until I breached their home. I’m also struck by how effective smoke is at keeping bees from becoming agitated in the first place. We are using eucalyptus bark harvested at a nearby high school to fuel our smoker, and boy has it worked when we’ve bothered to light it. It’s been a long and eventful month since I last wrote. Despite my best intentions, family reunions, memorial services, and obsessively watching the Olympics have precluded blogging. Luma peers out the back door of the nest boxes. We have our own little Olympian around here. Luma, who laid her first egg on July 6th, has gifted us with 32 perfect brown eggs in the past 33 days. She has deposited each egg without mishap in the upper right-hand nest box. Egg laying seems to have mellowed her; she no longer runs to avoid us, investing her energy in hunting down treats instead. Petunia, meanwhile, laid her first egg on July 28th and has taken two days off so far. In the days leading up to her first egg, Petunia became increasingly interested in Luma’s morning egg ritual. At the risk of audacious anthropomorphism, I would venture that Petunia was apprenticing, if you will—watching Luma in order to learn how to be a hen. On several occasions, she accompanied Luma into the coop, cackling with her over a new egg. The morning before Petunia laid her first egg, I found Luma pacing up and down the run cackling to high heaven. Petunia had tucked herself into a nest box, practicing. Petunia’s eggs are smaller than Luma’s, and white. The girls do not share a nest box. Instead, Petunia has set up camp in the upper left-hand box. The girls’ eggs. Note the blood smear on Petunia’s first egg. Ouch! Kelly and I have been enjoying lots of devilled eggs. We continue to talk about finding another hen to join the flock. I have suggested an Araucana. They’re said to be good layers, and the green eggs would allow us to keep track of each hen’s laying cycles.